Happy Thursday Critters! Today we have a debut author interview with Laura Roettiger! 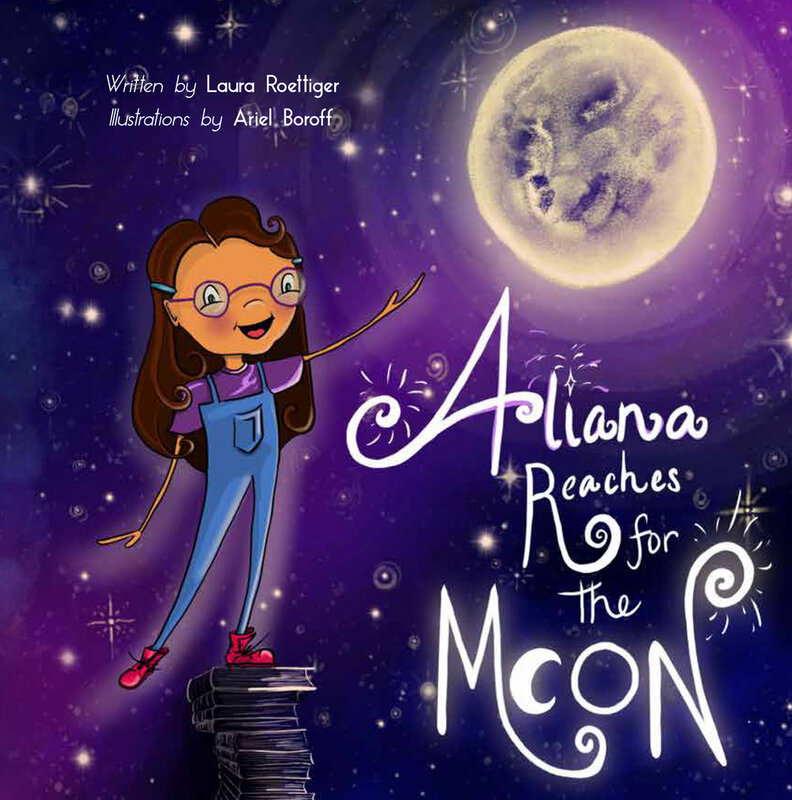 Laura’s debut book, ALIANA REACHES FOR THE MOON, illustrated by Ariel Boroff, releases on February 19th with Eifrig Publishing. We are so thrilled to have her here today to talk about her new book. I live in the Rocky Mountains at 8,200 ft just west of Boulder, Colorado. For perspective, Boulder is 5,340 ft but only 10 miles away so the road to where I live is quite steep. My backyard is National Forest so it’s beautiful but so different from Chicago and the suburbs where I lived my whole life before moving here in 2016. I was a reading specialist in Chicago and spent my days reading and writing with students. I often wrote stories for them when I couldn’t find books that I wanted to use. ALIANA REACHES FOR THE MOON was the first book I wrote with the intention of publishing. I know how rare that is; most people talk about the pile of unusable drafts they wrote before getting anything published. In late 2016 and early 2017, I received some love in a few pitch parties that ultimately led to rejection. They liked the concept but not the actual story. This is because the manuscript WASN’T READY and it’s a very different book now than where it was at that time two years ago. I also submitted to a few publishing houses that accept un-agented work, including Eifrig Publishing. I am a writer, not an illustrator, and they only take on fully illustrated books. I had been approached by a local artist who wanted to collaborate and her sketches were the first ones submitted to Eifrig along with the original manuscript, a letter that explained who Aliana was, my plans for a series of STEAM (Science, Technology, Engineering, Art, Music) books, and how the vision of Eifrig Publishing aligned with my values. She had editing and revision recommendations and I continued to work on the story. Fast forward to July 2017 at Southampton Writers Conference and my manuscript went through a revision that I have described as ‘performing surgery on a loved one.’ I know other people use the phrase, ‘kill your darlings’ but I didn’t want to kill my book, I wanted to make it better. The original manuscript was trying to do too many things at the same time. The final book kept many of the ideas and cut out others. When I shared it with Penny at Eifrig, she agreed it was 100% improved. In October 2017, the illustrator backed out of the project due to time constraints of her other jobs. Through a mutual friend, Ariel Boroff and I met and began collaborating. She has done an amazing job of bringing the book to life while working as a costumer on a TV show - “Station 19” which is a “Gray’s Anatomy” spinoff about a fire house. Aliana’s father is a fireman so we both felt like that was a nice overlap. I have a vivid imagination and often come up with ideas for stories when I am out in nature. I also like to do research and write by hand before I begin drafting a story. Sometimes the research doesn’t even end up in the manuscript, but it gives me additional background knowledge to draw on. ALIANA REACHES FOR THE MOON was originally written by hand. This year I participated in StoryStorm (31 ideas in January) which was fun. I have many ideas that I thought of when I wasn’t home. I text myself so that I can add them to the brainstorm document when I get home. It’s amusing to see the ideas and I wonder if anyone ever saw the texts if they would think I was crazy! My last two books, one which is ready to query and one which is still in revisions, came from different places. The first is inspired by my beloved Goldendoodle puppy, Charlie. I shared it on the 12x12Forum, with my two in person critique groups more than once, and I think it’s ready to send out into the world. I love thinking about that first day, the germ of the idea, and how it’s transformed now that it is ready to share and hopefully be loved. The other one, which is still a WIP was inspired by a 12x12 webinar about how illustrations and text work together in different ways. I’m trying to grow as a writer and try new things. This one is definitely a departure but so far the feedback from critique partners is good so I am going to keep polishing. I don’t usually have trouble coming up with ideas. In the beginning, I had ideas that I couldn’t figure out how to turn into stories. I’m past that now thanks to several classes, conferences, and studying picture books with a writer’s eye. I usually write in my dining room which has actually never been used for eating. It’s wide open with floor to ceiling windows, beautiful artwork, a desk and a large table for two different perspectives, furniture that belonged to my parents’ and grandparents, and interesting woodwork. I like to be comfortable so right now, since it’s winter I’m wearing a sweatshirt and soft flannel. Often I’m in my pajamas. I used to joke that if I was in my pajamas at noon that was the sign of a productive writing morning. There are so many and I hesitate to name names, but I will say I was fortunate to meet Amy Krouse Rosenthal, David Shannon, and Kevin Henkes while I was teaching and they were so generous with their young fans. That stays with me. I know this may sound funny, but Aliana is a dream project. She is based on my daughters and a few special students from Carlos Fuentes Charter School in Chicago. I have two more books written about Aliana and Gustavo, both which need further revision, and I can’t wait to see if the world loves her as much as I do. ALIANA REACHES FOR THE MOON is about a curious and creative girl who observes the bright light of the full moon. She uses information from books about the moon and experiments with light and reflection to create a surprise for her brother Gustavo. The book celebrates curiosity and demonstrates her patience and her parents’ patience. The messages are layered and not heavy-handed which is something I’m very happy about. I am also hoping to find an agent this year and am a Gold member of 12x12. Huge thank you to Laura for stopping by Critter Lit today! We can wait to see your book in the world on February 19th! Congrats! Laura Roettiger is the author of ALIANA REACHES FOR THE MOON. She is a life-long Chicago resident who moved to the Rocky Mountains in 2016. Living adjacent to Roosevelt National Forest and just a few miles from the Continental Divide has provided her with inspiration for much of what she writes about. In Chicago, she worked as a reading specialist and elementary teacher and raised three children who are also the inspiration for her writing. Her superpower is encouraging curiosity in children and letting them know she believes in them. Since moving to Colorado, she has worked in Environmental Education and is now a literacy mentor at a STEM school. In 2018, she adopted a Goldendoodle puppy, Charlie, who is the inspiration for her latest polished manuscript. FOR MORE INFORMATION about Laura and her work visit her website: www.lauraroettigerbooks.com. TO PRE-ORDER Laura’s debut book, ring up your local bookstore, or click here. Want a chance to win a SIGNED copy of ALIANA REACHES FOR THE MOON?! Comment on this post or share it on Twitter. One lucky winner will be selected Thursday, February 14th! US addresses only please. What's up on deck? Tune in next week for an interview with debut author Cathy Breisacher.